Former Captain Robert M. Wilbur Jr. agreed to give a personal interview to Neal, Saturday, September 24, 2016 while being honored at the 2016 2nd Annual Eastern Airlines Retirees Reunion and Celebration. Neal began by introducing Bob Wilbur as the former Eastern Airline Pilot who was hijacked aboard the Eastern Flight 1320 on March 17, 1970. Neal asked Bob to tell a little about himself. Bob said he was interested as a teenager flying model airplanes. Graduated to the airport in 1955 and got his wings and permission to actually fly in 1955. Again in 1965 flying C119 and C130 in Tennessee for a year. I was over in France for 3 years, hauling mail and cargo. Got out in June 1959 and went to Plant City, FL. I went down to Miami August 17, 1959 for a short stint. Worked for EAL 30 years. Enjoyed it very much. Actually started with EAL at JFK (Idlewild at that time), then a temporary short stint in MIA. I flew on the Martin 404, and then on the Constellation, Electra, and did some work on the 727, and the DC-9 as Captain. Flew the 727 and the 80-300 and the L1011 aircraft. Retired in March 30, 1994 - not with EAL. After EAL closed I went to Saudi Arabian Airlines for 4 years. It was entirely different flying 1011s, as they had the Pratt Whitney engines, not EAL’s Rolls Royce engines. Captain Wilbur said that after EAL closed their doors he, to quote a few folks “joined”, Saudi on temporary duty that got his foot in the door. Then Saudi gave him a contract the winter of 1989-1990 and wanted me to fly for Royal. Anita and I had just enough of the desert and wanted to come home even though we had a good repoire with the Saudi Arabians. It was common back then of Sheiks having a lot of money in oil; royal family had a private airplane that they even had it outfitted with the best emergency for inter-breeding, for medical was not worth anything, for lack of a words. Neal began to ask about the Hijacking and said to Bob Wilbur that he understands how difficult it is to speak on this. Just then the tower called and said 27 west. Captain Wilbur answered back, unable to turn west we are now flying east; we have a problem here (not knowing if this was this guy’s idea of suicide). He disconnected with Traffic Control and Jim Hartley grappled for Divivo and gunshots were heard, and then it went off again. Bang! Bang! Bang! He felt numbness in his arms. Hartley disabled the hijacker and grabbed for the weapon. He took the gun and put it on console. Captain Hartley said I got back on the radio and called Traffic Control and said we need a speedy handling, Co-Pilot shot, need doctor. Landing at Gate 12. Made a soft turn a mile out, but the guy wakes up; I took the gun and hit the guy over the head. We were making our Final Approach and I landed the airplane. Captain Wilbur was proclaimed a hero March 24, 1970 by the U.S. Senate who passed a resolution commending both he and F.O. James Hartley for their “extraordinary heroism and competence,” for their bravery in the Hijacking of Eastern Flight 1320 on March 17, 1970. 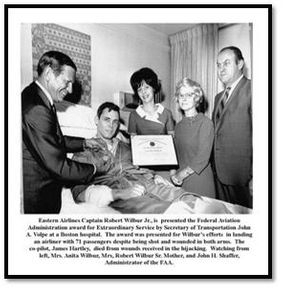 In addition, Eastern Airlines Captain Robert M. Wilbur, Jr. was presented the Federal Aviation Administration award for Extraordinary Service by the Secretary of Transportation, John A. Volpe at a Boston hospital. The award was presented for Wilbur’s efforts in landing an airliner with 71 Passengers despite being shot and wounded in both arms. 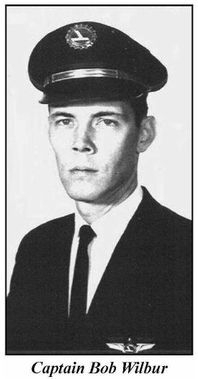 The First Officer, James E. Hartley died from wounds received in the hijacking. Captain Robert Wilbur Jr. received the Distinguished Achievement Award, the DaedalianTrophy (shown above) in 1970. Captain Robert M. Wilbur Jr.
Former Eastern Captain Neal Holland gave a special honor to Captain Robert Wilbur Jr., a great Eastern hero. Neal combined the 2016 2nd Annual Eastern Airlines Reunion and Celebration with the EAL Radio Show Hall of Fame Award that was held Saturday, October 24, 2016. Captain Robert M. Wilbur Jr. saved the lives of his passengers and crew aboard Flight 1320 hijacked in Boston, MA on March 17, 1970. Though being seriously injured, he landed the Eastern plane safely. Neal, our host, invited Bob’s very dear friend, a former Eastern Captain, Ed Shane to share the podium and relate his thoughts on the award. Ed spoke graciously about Captain Wilbur and his tremendous ordeal with the hijacking of his Flight 1320. Ed said, “The Daedalian Trophy given to Bob was the highest award a person could receive in aviation. It is a rare trophy, rarer than the Heisman, given for excellence in aviation and was given to Bob in 1970. He said other heroes received this too; Captains Eddie Rickenbacker, Ed Weisman, and recently Captain Sully who did a great job that he was trained to do, and Sully did it well. He also commented that no one in aviation in 1970 was ever trained on how to be shot in the arms.” Ed went on to say how Captain Wilbur was shot and by then, everyone there was so moved that tears were in their eyes and rolling down their faces. “This Eastern Airlines Hall of Fame Special Recognition is presented to Captain Robert Wilbur, Jr. in admiration and respect for his extraordinary heroism and selfless act, despite his own serious wounds, in saving the lives of his passengers and crew aboard the Eastern Airlines Flight 1320, March 17, 1970. The Eastern Airlines Radio Show presents this award on this 24th Day of September, 2016”. Captain Robert M. Wilbur, EARA recognizes your heroism on March 17, 1970, your courage and actions on Eastern Flight 1320 that saved the lives of both passengers and crew members. Presented to you on September 24th, 2016. Captain Neal called Conni Kerrigan, President of the International Silverliners as our next Speaker and she presented Captain Wilbur with a Plaque of the Resolution from the Silverliners. He then read the letter sent to us on behalf of REPA who also wrote a Resolution signed by the President of the Retired Eastern Pilots Association and presented it to Captain Wilbur. There was more… Captain Neal then read a letter to Captain Wilbur by Captain George Jehn who was not able to attend. Captain George flew as Co-pilot with Captain Wilbur many times, and has had a long friendship. Captain George said “I’m truly sorry that I couldn’t attend the second Eastern Airlines Pioneer’s Reunion, especially to pay homage to my good friend and fellow former Eastern pilot, Captain Bob Wilbur”. Though Captain George was not there with his presence, he was truly with us in his thoughts. I presented Captain Wilbur with a Memory Box of Cards from members who could not be there, along with a Congratulations and Thank You Card Poster signed by the members to express their gratitude for his courage. Our photographer, EARA President, Michael Zall took a photo of Captain Wilbur with his family.The memories of this EAL Radio Show Hall of Fame were an extraordinary honor for Captain Wilbur’s family to take away to treasure, as we will too. The honor was given to a very humble and private person…and our Eastern hero.